Media coverage of the recent federal government shutdown provided sharp focus on how large segments of Americans are living paycheck to paycheck today, even among those seemingly solidly employed. As we explored in depth in our report The Business of Thrift 2018: Understanding Low-Income and Value-Oriented Consumers and as the effects of the shutdown underscored, the Great Recession of 2008-09 exacerbated difficulties for a wide swath of households and their finances, with reverberations that are ongoing today. While jobless rates are at historic lows, a significant number of America’s consumers still feel the effects of the downturn: many are still trying to pick up the pieces of lost homes, lost jobs, delayed retirement and student debt. Reflective of events seen during the shutdown, our research finds that for low-income shoppers making far less than federal workers, food and beverage shopping is driven by payday cycles, and income level plays a big role in how they spend money at that time. When it comes to grocery shopping, 63% of low-income shoppers do most of their shopping after payday (vs 30% of mid/high-income shoppers). Such stark financial realities fuel the growing dependence on shopping discount food retailers, including the likes of Walmart and dollar stores. 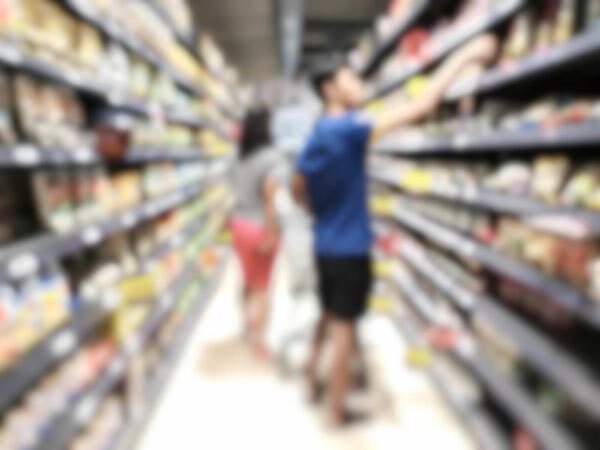 This reflects the fact that federal standards now classify over half of U.S. consumers as “low income,” which means that the population of consumers who weigh food and beverage against other necessary expenses is likely much larger than typically thought. The strength of discount shopping behavior is illustrative of ongoing financial stress and wariness within many households, especially since use of dollar stores was predicted to shift into neutral (or even reverse) as America’s economy gained momentum post-recession. Instead, dollar stores have grown considerably in numbers since the recession, with Dollar General noting recently that it hopes to add over 975 stores in 2019 and introduce a greater variety of fresh foods and beverages. Value-oriented shoppers are attracted to deep-discount specialists like Grocery Outlet, Aldi and Lidl because they perceive these retailers as successfully bridging savings and quality in their offerings. This is why, as our research uncovered, Walmart is especially popular among many low-income shoppers, particularly struggling Millennials, a generation estimated by the Federal Reserve Bank of St. Louis as having lost as much as 34% of their net worth compared to previous generations during the same life stage. Given the population size of low-income consumers and the reach of frugality-as-necessity into the middle classes, understanding low-income and value-oriented consumers and their shopping behaviors is more important than ever before. Whether due to real or perceived need, the Great Recession turned American shoppers into deal hunters. This cultural trend was amplified by a growing number of resources, including smartphones and online resources, but also the proliferation of dollar and discount stores. In general, low-income shoppers, particularly those on the lowest end of the income scale, don’t have the resources to aggressively hunt deals. They stick with what works – familiar, convenient retailers and restaurants where they know they can get what they need at a price they can afford. Only after they make a bit more – around 250% FPL – do promotions and cross-channel shopping become key features of their shopping. Low-income consumers’ grocery shopping is tightly focused on price and convenience. They rely heavily on Walmart, discount grocers, and dollar stores, spending a greater share of their grocery dollars there than at others. 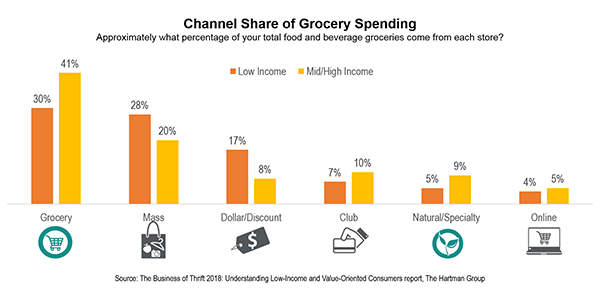 Low-income consumers’ purchasing is similarly concentrated on a narrower range of categories focused on essentials, and they’re less likely to buy fresh perimeter categories as well as “extras,” like ice cream. Consumers under financial pressure are diverse and complex: How consumers spend and save is impacted by individual circumstances, broad economic trends, and cultural beliefs about the right and wrong ways to deal with money. Most consumers engage in “thrifty” behaviors — especially in their household shopping — because this type of frugality is culturally valued. However, for mid/high-income consumers, frugality is more of a choice, whereas for low-income consumers, it is a necessary way of life. Many sub-groups exist with low-income attributes, include struggling Millennials and rural consumers. Struggling Millennials aspire to participate in their generation’s food tastes, wishing for more premium, organic, and new, interesting foods in their diet. They’d also like to cook more and eat less frozen and restaurant food. This group more than others seems to feel like they are missing out when it comes to eating, health and wellness, and living a satisfying life. They see more barriers to their goals, and their barriers tend to focus on external factors – lack of money, time, and energy – rather than personal preferences. Rural consumers are a demographically distinct group that faces unique barriers to their eating and health and wellness aspirations. Their meal planning, shopping habits, restaurant visits, and savings strategies are highly dependent on what is available and their ability to travel. Younger shoppers and those with kids want to participate more in mainstream food and wellness culture. They’re looking for foods with quality and culinary cues that are tasty and nutritious and that are easy to store and prepare. For such consumers, interesting twists on mainstream flavors and cuisines help minimize the risk of trying something new. Rural consumers are more conservative when it comes to food but still desire a more healthful diet, with greater access to fresh foods. The Hartman Group’s unique brand of combined quantitative and qualitative data, insights and strategic analytics come together in all the reports we offer to help you better understand how changes in consumer behaviors are reshaping food and beverage culture — and your business.